Mix these three ingredients with pesto for a quick dinner. 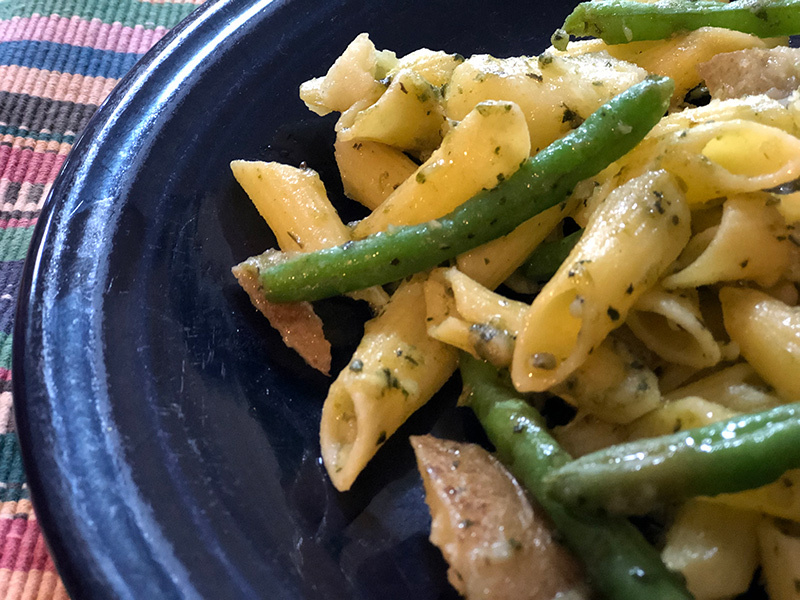 In search of the easiest possible way out of making dinner over the weekend, I fell back on a family favorite: Potatoes, Pasta, Pesto, and Green Beans. I like to call it PPP&G. It’s a great dish to whip up when you don’t feel like eating another pork chop, or more round steak surprise. I even went as far as cheating (shocker, I know) by using Pam’s Pesto again (maybe I should check to see if I can purchase stock in the company). Anyway, I dreamed this up several years ago when I was trying to be a vegetarian. That was just before I was seriously working on honing my karaoke skills by singing “Build Me Up Buttercup” over and over. I was a more successful vegetarian than a singer. And because I could eat pesto all day long, it came to me that I could add it to just about any standard dinner fare and it would make it all better. And trust me, everybody who’s tried this loves it almost as much as I do. Cut five good-size potatoes into chunks and put them in salted water to boil. In another pan, boil more salted water for pasta cooking. Cook about half of a pound box of pasta. When the potatoes are about five minutes away from being done, put a couple of large handfuls of fresh green beans in the same pot. Timing is everything, so be sure the pasta, potatoes, and green beans are done around the same time. Drain it all in a colander, and top with a container of Pam’s Pesto, or if you aren’t lazy like me, make your own pesto and add a cup to the pasta mixture.